"If you put him against producers like Quincy Jones, he make these guys look like rubbish." Lee Scratch Perry may not be exactly a household name, but in the world of reggae music he is one of the most influential and respected record producers and recording artists around. From the 1960s through today, Perry has continually put his creative production mark on a number of highly regarded reggae releases, including some monumental work with Bob Marley and The Wailers in the early 1970s. This 1991 European-made documentary from Ludo Timmermans, running a scant 48 minutes, takes what could—and should—have been a truly fascinating piece, and sadly spits out not much more than an incomprehensible string of mostly unintelligible soundbites. The problem is twofold; Perry's thick-as-molasses yet rapid Jamaican patois is all but impossible to decipher more than a few words here and there, and a complete absence of subtitles of any kind compounds this frustration. 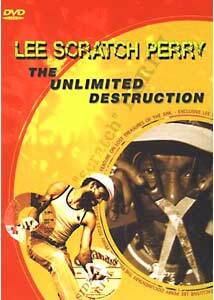 I don't fault Perry's language (that's the way he speaks, deal with it), but I can't imagine why this disc couldn't be outfitted with some type of subtitle function; without that option, Lee Scratch Perry: The Unlimited Destruction is simply a blurry, hit-or-miss audio minefield. The documentary was largely shot in Switzerland (Perry's current home), and we see the producer, bedecked in some dazzlingly gaudy bling-bling that would make any rap star envious, moving an assortment of plants around his garden and expounding long, hard to understand rambles. As a rule, I can usually get into the flow of a heavily-accented voice eventually, but with Perry it was pretty much a lost cause. I repeatedly replayed segments, listening intently, and I still had trouble picking out more than a word or two here or there. This made following the flow and content of this narration-free film a challenge that I just couldn't conquer. This is all about music, ultimately, and Timmermans has graciously wallpapered his film with a steady stream of Perry-manipulated reggae. Songs from a wide range of artists (such as Marley, Flying Sensation, The Soulettes) fill every crack and crevasse, enough so that a soundtrack disc would be a no-brainer required purchase for any fan of reggae. In fact, if this disc had an isolated music track I could have overlooked the difficult to understand Perry in favor of simply enjoying his creations. Image Transfer Review: This is a decent enough 1.33:1 full-frame transfer, and considering it is a low-budget documentary that is taken into consideration. Much of the material is traditional talking head kind of stuff, and while colors are fairly dull, they do remain consistent throughout during the interview segments. Audio Transfer Review: The 5.1 audio track is a bit of a disappointment, and it has a steady layer of annoying echo during much of the presentation. The background music fragments sound fine, but any spoken dialogue has a harsh, flatness to it. Rears are silent for the duration, and there is little in the way of any type of spatial imaging. Extras Review: The bulk of the extras on this disc are simply a listing of Lee Perry projects, which is certainly an impressive roster, to say the least. Problem is the way the material is presented, in all manner of tiny, hard to read fonts and spread across what seems like a couple of redundant sections. The best part, for me, was the featured track listing of the songs used as background in the documentary, and I have added a number of those to my "must own" list. A three page insert, which presents a chronological history of Perry, provides more succinct info than does the film itself. As I mentioned, the absence of subtitles is a glaring oversight, one that makes what could have been a truly fascinating documentary almost unwatchable. A potentially fascinating documentary is mired in a release with no subtitles and a subject who speaks in a swirling, thick Jamaican accent that is nearly impossible to understand. This was a major disappointment, but at the very least the background music was superb.